What does Soil Carbon Research Program (SCaRP) tell us? This could be baffling. After 3 years and $25m the message coming out of the Soil CarbonResearch Program seems to be: land management decisions have little impact on the amount of carbon sequestered in the soil. Rainfall zone and soil type have a big impact on soil C levels, but not the farmer. I don't get it. We lost 50% of our soil carbon in the last 100 years. 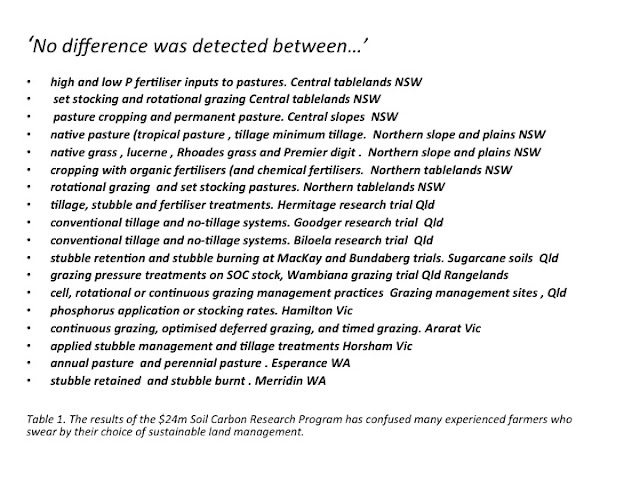 What caused that if it wasn’t the impact of soil management practices? CSIRO’s Dr Jeff Baldock, who managed SCaRP, says the soil sampling was not conducted to quantify sequestration of carbon in soils. “The three year duration of the study would not allow estimates of carbon sequestration to be derived with high certainty. The samples therefore are a baseline measurement of the soil carbon stocks within the various combinations of soil type by management regime within each agricultural region,” he says. 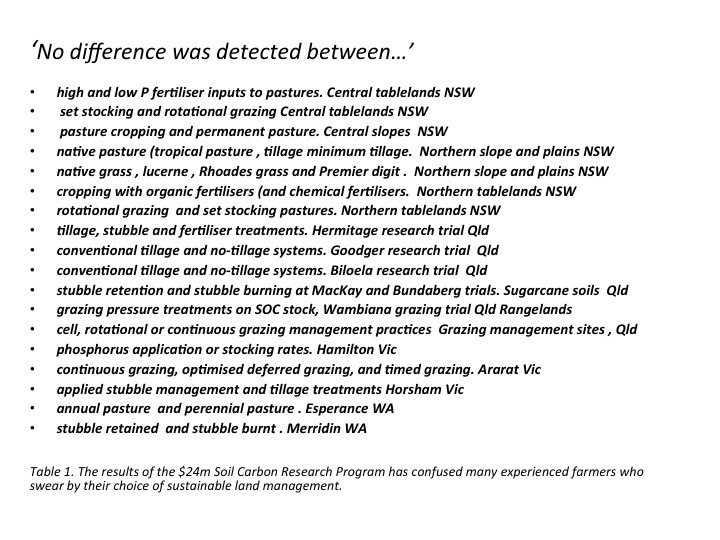 While the impact of climate, soil type and management regime was studied, there was an ingredient missing: the farmer. The skill level of the farmer in the agricultural practice that they nominate will affect the result. That skill level could be directly related to the length of time the practitioner has been practicing. Every successful practitioner will tell you that it can take several years to get their system right. It is not a matter of simply applying a ‘practice’ to an area of land to get a standard response. Overlooked in the first analysis were a group of “high performance” soil carbon managers who have demonstrated a potential well beyond the average. 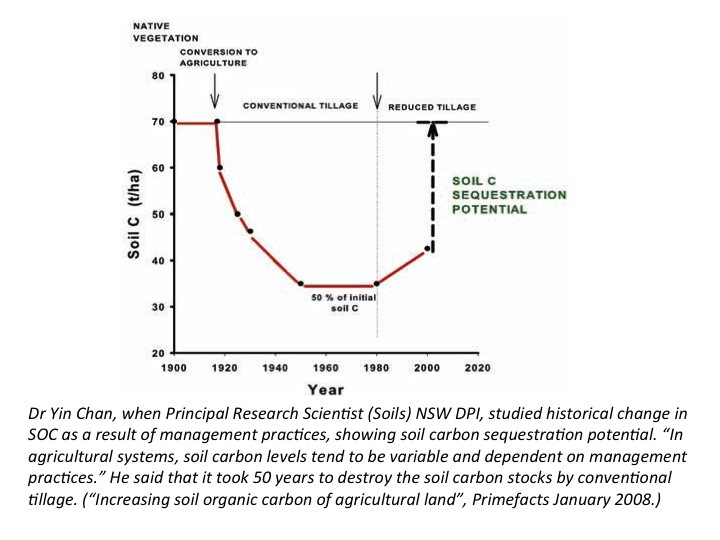 “These ‘outliers’ present a challenge for the conventional estimation of the potential of Australian soils to sequester carbon. If these outliers can do it, it can be done. In his presentation of the results of the SCaRP, Jeff Baldock pre-empted the shift in the paradigm: that it is not the management practice we must study to understand the potential for soil carbon, but the particular farmers in whose hands the practice can produce the results that led Professor Ross Garnaut to estimate that soil carbon could account for 40% of Australia’s emissions. "We need to catch and analyse samples that do not fit current calibrations," says Dr Baldock. The absence of a pattern is "at least partially due to variability that existed within management classes." Here he identifies the existence of high performance carbon farmers. Farmers don't perform uniformly within a management class - many are average, and some are very good. When you average them the results tell you nothing about the potential of the class. There is no allowance for skills, time spent learning the technique, incentive of carbon offsets, etc. "It ain't what you do, it's the way that you do it. Another issue that could influence the outcome would be the combination of practices, which is common. Eg. grazing management and pasture cropping and/or compost tea inoculant applied to the same paddock.